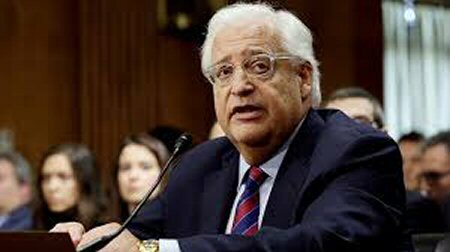 The American ambassador to the Israelis, David Friedman, has threatened to replace Palestinian President Mahmoud Abbas if he persists on refusing to resume the process of peace talks, and boycotts US administration. “Time does not stop, and if Abbas continues to refuse to run the negotiations, someone else will come to do so, Friedman told the Israeli daily “Shavei”. He said that he did not take Abbas’ remarks against him and calling him the son of the dog seriously, adding that such statements hurt the status of Abbas among his people, and that uttering abusive words will not improve the lives of the Palestinians in the end. According to Al Ray, Friedman referred to the law “Taylor Force,” which was enacted by the US Congress recently, and which requires the PA to stop the payment of salaries of prisoners and martyrs in order to keep receiving US funding. “You can not show hostility against US interests and, at the same time, get aid as if nothing happened,” he said. Earlier this month, Abbas described the American ambassador to Israel as a “son of a dog,” in response to Friedman’s harsh criticism of the PA over its refusal to condemn acts of resistance carried out by Palestinians. It is worth mentioning that peace negotiations stalled after Israel refused to halt settlements, accept a two-state solution based on the 1967 borders, and release Palestinian prisoners from Israeli jails.